Through our partnership with The WORD Church, The Fulfillment Project offers many free programs and services to the community ranging from free health and wellness classes to monthly providing food for families in need. Through these programs we have assisted thousands of people from all walks of life without discrimination especially those in economically challenged areas. With youth being a great majority of who we serve, we are excited about this year’s 8th Annual “Back-2-School Jamboree and Family Expo”, taking place Saturday, August 11 at 11A at the M.O. Campbell Educational Center (1865 Aldine Bender Rd. | Houston, TX 77032)! This year’s event is going to be nothing short of amazing. It’s an event for the entire family. We are here to serve you! To ensure this event runs smoothly, please read below to see how the event will be handled. You do not have to pre-register for this event. School supply packs/Backpacks are on a first come first serve basis. 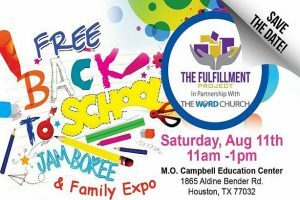 Every child that you register onsite to receive school supplies MUST be present. If you know anyone who can benefit from this event, feel free to share! We are blessed to be a blessing. See you soon! Throughout the year The Fulfillment Project desires to give back to our community and city in EXTREME ways and this Holiday season is no different as we present, “Extreme Thanksgiving Food Giveaway 2018”! As in years past, this year as we observe the Thanksgiving Holiday we will continue to be a blessing to families in need. The Fulfillment Project will give away free boxes filled with food. Boxes will consist of uncooked food that includes meat (turkey or chicken), non-perishable food items and a case of water. The great thing about this event is, it’s FREE! Please stay connected for more information about Extreme Thanksgiving 2018! As with our “Extreme Thanksgiving” The Fulfillment Project aims to make holidays memorable for all that we serve, that’s why this year’s “Christmas In The Community” will be our largest one yet! Through our “Christmas In The Community”, we will again give FREE toys away for children in need ages 2-12! We are looking forward to blessing hundreds of families this day, but we can’t do it without you! Please consider being a financial partner and help is bring Christmas cheer to those in need. TFP Care Homes is an initiative birthed out of the mission of The Fulfillment Project, to specifically meet the needs of women and children seeking shelter as they transition out of abusive environments. At each TFP Care Home, it is our desire to empower victims of family violence by providing safe housing, counseling and skills that create independence while building community engagement and advocating for social change to stop family violence. Family violence, which includes domestic violence, is not limited to the abuse of an intimate partner in marital or dating relationships, it even includes the abuse of children and other family members, and the abuse generally escalates over a period of time. Family violence is a national epidemic that daily results in emotional trauma, physical injury, and sometimes death. In the United States alone, an estimated 4 million women are physically abused by their husbands or live-in partners every year and an average of 8 women are killed by their abusers every day. These numbers are pretty tough to digest, but the greatest observation from this report is that 15,869 requests for shelter went unmet and 39% of the people who sought shelter were denied because of lack of space! While there are some great agencies providing help and resources, the need is greater than the available resources. This is a distinct cry for help thousands are making, that with your help we can be the answer to their prayers. TFP Care Homes can’t serve and support survivors of family violence without the contributions of the community. Your donations of time, talents and financial gifts are crucial to helping families find their way from fear to safety. Every gift large or small makes an impact! Programs geared to helping youth throughout the City of Houston from underserved areas reach their fullest potential through our many programs and events. These programs are geared to help empower the human potential in adults throughout the City of Houston from underserved areas or disadvantaged situations to participate in the profitable mainstream in every area of life. The Prime Time Seniors’ Program will serve to enrich the lives of community members who are age 55+. The Fulfillment Project is committed to providing programs to our seniors which engage the physical, intellectual, social, vocational dimensions of wellness, as well as encourage involvement in the community. We believe in providing resources to aide in the fight against hunger in our communities. 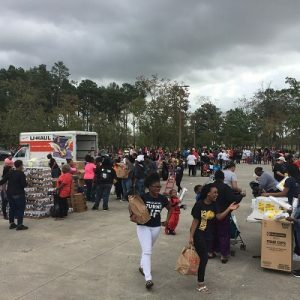 Through our partnership with the Houston Food Bank, our free community food pantry, WORD+MART, services hundreds of families with food and toiletries on a monthly basis. In addition, we are constantly gathering and purchasing items, plus our TFP Partners and Friends assist greatly by making regular charitable donations to aide our cause. For a list of supplies we are in constant need of or to receive more info on how you can be involved, please feel free to E-mail us at info@thefulfillmentproject.org. Providing aid in times of need is the cornerstone of The Fulfillment Project’s philosophy, which promises to stand by communities during times of crisis. Since our inception, TFP has demonstrated its commitment to communities in crisis by donating financial support, emergency supplies, drinking water and food, as well as providing efficient ways for volunteers to assist those affected by a natural disaster. Kicks 4 Kids, our newest initiative, was birthed on the heels of Hurricane Harvey. Several entities during the recovery period after the storm ensured kids who were affected by the storm received school uniforms, but no one focused on, you guessed it, shoes! With the generosity of our Community Partners at the Rotary Club of West U, we were able to purchase hundreds of pairs of new shoes for local students in the Houston area! We thought why stop, and the birth of Kicks 4 Kids has been a driving initiative ever since. A once disaster relief initiative has morphed into an ongoing facet of TFP to provide underprivileged kids with new shoes in hopes of alleviating one of the most burdensome social pressures for inner city youth — lack of adequate footwear — which often leads to bullying. With support from community stakeholders, Kicks 4 Kids boosts self-confidence of inner city youth while providing one of the most basic needs.